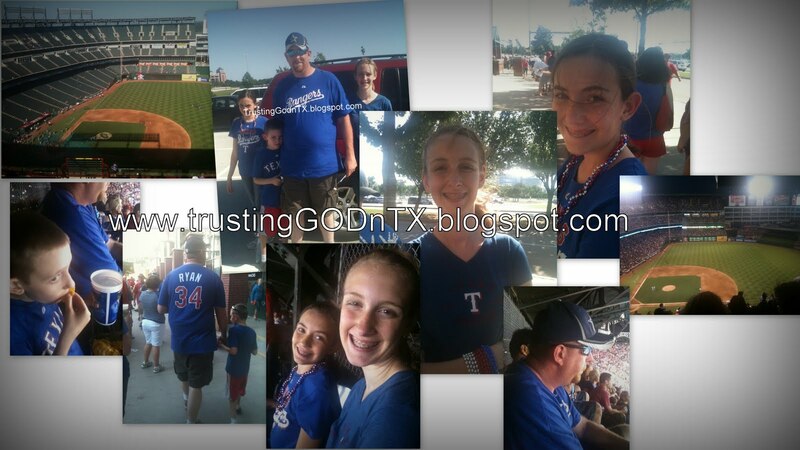 Trusting God: Take me out to the ball game! For my baby girl's 11th birthday we went to our first Texas Ranger's game as a family! The stadium was sold out! That is over 46,000 people all cheering for the defending National Champions! The food was better than we thought it would be. Our seats were at the very tippy top but the view was perfect and the wind helped us stay cooler. I bought everyone new Rangers shirts for the special occasion. Even though the Rangers lost (boooo!) we had an awesome time and plan to go again this season. Next time we are tailgating!